Microsuction is the removal of ear wax/debris using microscopic vision and a gentle suction device. Unlike irrigation, the clinician is able to visualize the ear canal to safely extract the wax. Microsuction is considered to be the safest procedure for wax removal and in some cases it is the only method that should be used. The use of an ear wax softener is not required and in most cases treatment is completed in one 20 minute session. Microsuction will remove the infected debris enabling your topical treatment (antibiotic drops) to reach the lining of the ear canal. The word tinnitus comes from the Latin word for ringing and is the perception of sound in the absence of any corresponding external sound. The British Tinnitus Association supports the use of microsuction as a method of wax removal in patients who have tinnitus. A perforated eardrum or punctured eardrum is a rupture or hole of the eardrum. Water entering the ear canal should be avoided to prevent infection. Ear irrigation/syringing should not be attempted, microsuction is the safer option. The clinician is able to visualize the complete external ear canal any cavities resulting from surgery. Microsuction is far more effective at removing wax from the stubborn areas within a cavity and considerably safer than irrigation. If you wear a hearing aid or are aware that your hearing is poor, it is important to look after and try to maintain the hearing you have. Microsuction is considered the safest technique for the removal of ear wax. Meniere's disease is a disorder that affects the inner ear. It can cause vertigo, tinnitus, hearing loss and the sensation of pressure deep inside the ear. The symptoms and severity of Meniere's disease vary widely from person to person. Microsuction is considered a better option for removing wax from people with ongoing ear problems. Vertigo is the sensation that you or the environment around you is moving or spinning .Attacks of vertigo can develop suddenly and last for a few seconds or they may last much longer. Episodes of vertigo occur more frequently with irrigation than with microsuction. 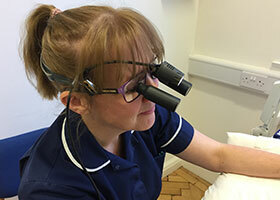 Manchester Ear Clinic offers microsuction performed by a Specialist ENT Nurse; Joanna O?Brien.